Sarah Nader- snader@shawmedia.com Crystal Lake South's Annika Sevcik (left) is guarded by McHenry's McKayla Snedeker while she shoots during the second quarter of Friday's game in Crystal Lake December 5, 2014. South won. 49-44. 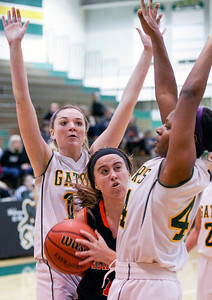 Sarah Nader- snader@shawmedia.com McHenry's Ashley Kaempf (center) is guarded by Crystal Lake South's Chanel Fanter (left) and Kianna Clark while she tries to shoot during the first quarter of Friday's game in Crystal Lake December 5, 2014. South won. 49-44. 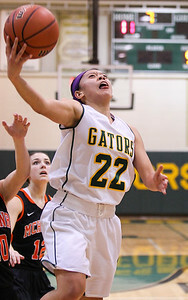 Sarah Nader- snader@shawmedia.com Crystal Lake South's Gabrielle DeJesus shoots during the second quarter of Friday's game against McHenry in Crystal Lake December 5, 2014. South won. 49-44. 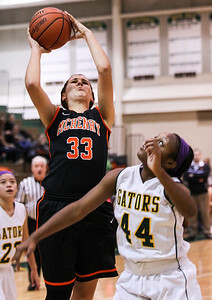 Sarah Nader- snader@shawmedia.com McHenry's Alexandria Martens (left) shoots over Crystal Lake South's Kianna Clark during the third quarter of Friday's game in Crystal Lake December 5, 2014. South won. 49-44. 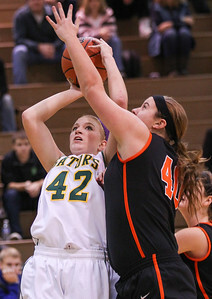 Crystal Lake South's Annika Sevcik (left) is guarded by McHenry's McKayla Snedeker while she shoots during the second quarter of Friday's game in Crystal Lake December 5, 2014. South won. 49-44.